My Shopping Ban has officially started today, i.e 1st Feb 2013. The date has been marked on the calendar. I was planning on writing a post for the cynics who are continuously questioning the ban. Of course one could shop smartly, and not indulge or go crazy. I could do that too. But where's the fun in that? Unless there is a little drama, there is not motivation. Right? We all might have our own struggles but as far as I can see everyone wants to learn to spend smart. 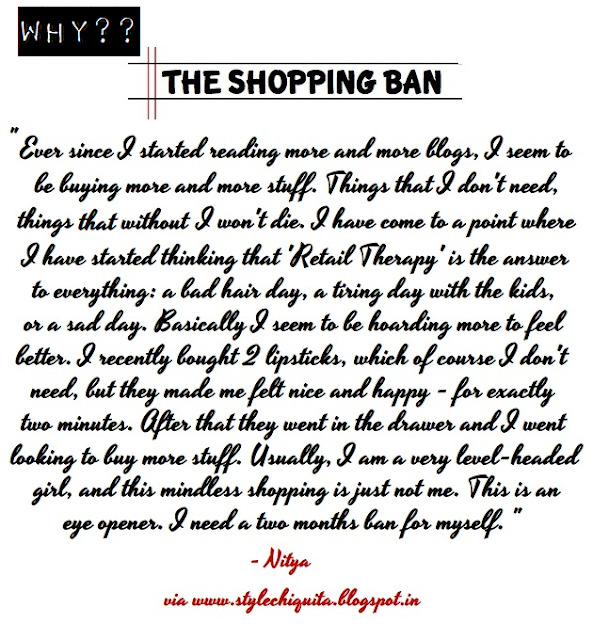 You can read everyone's reason for self-imposing the #shoppingban here but I am sharing Nitya's reason below. I will be constantly adding everyone's reasons to the album over the coming days. Anyhoo, I think Nitya's reason and Shopping for Happiness Study done by the Online Psychology Degree below, pretty much says it all.